BRAND NEW LUXURY CONDO! 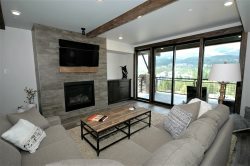 Spectacular views, Contemporary rustic, Pool, Hot tub! How do I book a home? You can either make a booking directly on this website by using the "check availability box" to the left. Or you can call our office at 855.466.4667 and a receptionist will be glad to help you. We implement a variety of security measures to maintain the safety of your personal information when you place an order. We offer the use of a secure server. All supplied sensitive/credit information is transmitted via Secure Socket Layer (SSL) technology and then encrypted into our payment gateway providers database. It will only be accessible by those authorized with special rights to such systems. They are required to keep the information confidential. After a transaction, your private information (credit cards, social security numbers, financials, etc.) will not be stored on our servers. What are the benefits of a vacation home rental? Our vacation homes are stocked in such a way that you always feel like you are coming "home" to your "vacation home" rather than returning to a small hotel room. Our homes have full kitchens, with some homes having game rooms, hot tubs and BBQ grills. You will be able to enjoy a full service home while you are on vacation rather than a small, cramped hotel room. Where is your town located? Big Sky is the mid-way point between Bozeman, MT and West Yellowstone Montana. We are 45 miles from the Bozeman airport and 45 miles from the West entrance to Yellowstone National park. Big Sky is a scenic mountain community with an abundance of wildlife and outdoor activities. Check in time is 4:00 PM unless we have approved an earlier check-in. It is possible your home won't be ready prior to 4:00 PM so please communicate your arrival time with our staff. We want to create a great impression and arriving prior to us inspecting your home can create problems. You will proceed directly to your property using the driving directions we have provided. We will arrange a time to meet you at the property. GPS is not reliable so it is important that you print your directions. If you find you have forgotten these, each property has a Google Map on our site under the property's listing. What if I am arriving late? We understand if you need to arrive later in the day. Please inform us of your time of arrival or if you are delayed on that day with our receptionist or the number listed on your driving directions. We will leave lights on at your property and you will be able to access the property using your driving directions and access code. If it is very late we will most likely meet you the next morning, if needed. However, if you get lost or have a problem you can always reach one of us using the numbers listed on your driving directions. How do I get keys to my property? Two weeks prior to your arrival you will be provided with the driving directions and a keyless entry access code that will open your property. We have adopted a keyless entry system for easy entry and less hassle dealing with keys. The check-out time is 10:00 AM, sharp. A late check-out fee equal to one-half of the nightly rental rate will apply on un-approved late departures or on departures that need to be later than noon. If possible we will grant complimentary late check-outs up to noon on the day of departure. You MUST CALL or EMAIL and get written approval for a late check out. This can be done 48 hours prior to departure. Note: this can only be extended on homes that do not have an arrival that same day. We are unable to extend past noon without a 1/2 day rate charge. No, unfortunately most all of our properties are not pet friendly. You can call our office at 855.466.4667 and a receptionist would love to help find a home that is just right for you. Is there a cleaning fee for homes? Yes, a one time cleaning fee is charged for each guest stay. The amount of this fee is based on the bedrooms, baths and overall size of the accommodation you select. Each home is thoroughly cleaned and prepared prior to your arrival. Cleaning services during your stay are available for an additional fee. Please inquire. Do I need to bring linens? No, all of our vacation rentals have professionally laundered, high quality sheets and towels. Hot tub towels are also provided. Do you provide paper products, soaps and other household supplies? Yes - our vacation rentals are furnished with a supply of paper and soap products for use during your stay. This includes paper towels, toilet paper, face tissue, bath gel, dishwashing soap, garbage bags, Windex, a clean sponge and laundry soap. Cling wrap and foil are also provided in most properties. Most homes have a basic supply of spices, but we do not stock pantries. There are coffee filters, and some starter coffee. Firewood, a lighter and firestarters are provided for properties with wood-burning fireplaces.